The file Imperium Third Worlds is a modification for Star Wars: Galactic Battlegrounds - Clone Campaigns, a(n) strategy game. Download for free. 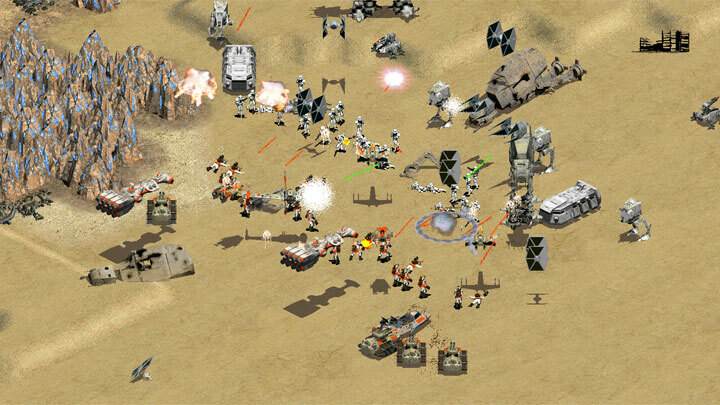 Imperium Third Worlds is a mod for Star Wars: Galactic Battlegrounds, created by Old Tanks. A new SP campaign. The plot is most likely not familiar to you, including the era in which it occurs, since we wrote an independent story, creating a new era in Star Wars. For the fourth year there has been a civil war throughout the galaxy. The Galactic Republic has changed the Senate, now it includes only 1 representative from 5700 planets. After that, a number of laws were adopted, placing the worlds of the so-called Third World in an even more distressing situation. A huge number of worlds remained dissatisfied with such changes in the Senate and revolts that took place over the next 2 years began. Two years later, after the beginning of the uprisings, the Union of Justice was formed, which aimed to stop such a policy of the Galactic Republic. and the policy of the Galactic Republic in relation to the so-called Third Worlds has become even more rigid. Three years later, the Restored Union of Justice was formed, which set the same goal as the Union of Justice. Taking over the first 2 months under the control of more than 100,000 systems (voluntarily), he committed the first attack on the planet of the Galactic Republic. Although the battle was won by the Galactic Republic in a few hours, this day began to be considered the beginning of a new civil war. who did not get a seat in the Senate of the Galactic Republic (and they were dissatisfied with it), as well as those who considered this policy of the Galactic Republic to be erroneous. it sounds more frightening for the enemy and adds greater patriotism to the people of the RUJ, which makes the RUJ stronger through the psyche. Attention: the mod is delivered in the archive with the extension .zip, extract (unpack) it to install the mod, for this use the program Winrar or similar. To install the company, move the contents of the Campaing folder to Game / Campaing. To install script sets from the company, move the contents of the Scenario folder to Game / Scenario.